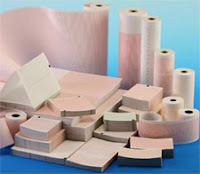 Medical Supplies & Medical Equipment Information: What is the advantage of using medical mounting paper? What is the advantage of using medical mounting paper? Medical mounting paper, often called medical mounting cards since it is sturdier and heavier that standard paper, are a great advantage for a variety of uses in hospitals and health care facilities. Often images such as x-rays, ultrasounds, and other types of recordings done by EEG, ECK or life monitoring devices are very thin and flimsy, prone to tearing, bending and wearing. By mounting the image or results on the stiffer medical mounting paper the document or data has a durable, long lasting backing that resists bending, folding and tearing. It is also easier to place these cards in files and charts since they don't tear out when the pages are turned and removed. Smaller data charts and pages also are much less likely to slip out of a file or folder if they are mounted than if they are simply left loose or kept in a sleeve in the folder or file. What are the standard sizes of medical mounting paper in common hospital and health care facilities? As can be imagined the most common size for medical mounting paper is the standard 8 ½ inches by 11 inches, just like standard letter sized paper. This means that the cards or papers can be easily inserted into medical files and records or into binders and books without sticking out past the edges and posing problems for storage. The cards, however, can be cut to whatever shape and size may be required. For mounting data for presentations or discussions the cards can be cut in half or quarters, allowing each member of the team to have a durable copy of the records for their information during the meeting. Can the adhesive medical mounting paper be used repeatedly? Removable adhesive medical mounting cards are an option, as are cards without an adhesive. Both are good options for routine use, however the adhesive cards can be much easier to use when adding material to the cards to place in a patient's folder or file. Documents, data and test results can be removed from the adhesive easily and then replaced when no longer required. As with any adhesive type of material it is reusable but over time it will need to be replaced with continuous use. Where can I buy medical mounting paper and is it available online through a medical supply company? Not all medical supply companies, either online or in traditional stores, offer medical mounting cards. There are a few online that offer both the adhesive and non-adhesive options and they are surprisingly low cost. While having a computer file or data document can be a simple and effective way to store information about a patient it isn't always available in a patient friendly format. Having the mounting cards to use when consulting with patients and showing them the results from a test really helps them understand your information. Taking the time to find a company that sells this paper product is well with the effort.